Suffolk County Crime Stoppers and Suffolk County Police Second Squad detectives are seeking the public’s help to identify and locate two people who stole jewelry from a store in Huntington Station. 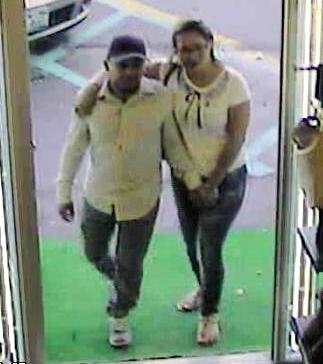 Huntington Station, NY - October 29th, 2013 - Suffolk County Crime Stoppers and Suffolk County Police Second Squad detectives are seeking the public’s help to identify and locate two people who stole jewelry from a store in Huntington Station. A man and a woman entered Love My Jewels jewelry store, located at 301 Walt Whitman Road, on October 2, 2013 at approximately 3:55 p.m. While the female distracted an employee in the back of the store, the man reached over a counter in another part of the store and stole several trays of gold and diamond jewelry valued at more than $40,000. One subject is described as a Hispanic female in her late 20s, approximately 5 feet 7 inches tall and 140 to 160 lbs. with brown hair. She wore glasses and had acne on her face. She was wearing a white blouse, blue jeans and sandals. The other subject was described as a Hispanic male in his early 30s, approximately 5 feet 5 inches tall and 140 to 150 lbs.He had black hair and a dark complexion. He was wearing a baseball hat, a white long-sleeved shirt, jeans and sneakers. Subject: LongIsland.com - Your Name sent you Article details of "SCPD Crime Alert: Duo Wanted for Jewelry Store Robbery in Huntington Station"